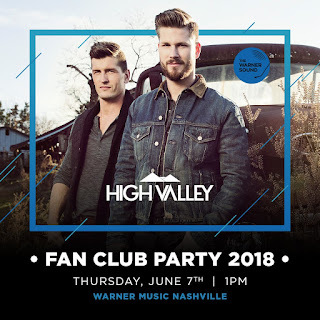 High Valley Announces 2018 Fan Party! Tickets On Sale Now! High Valley has announced that they will be holding a fan party during CMA Fest week! The party will be held at Warner Music Nashville - 20 Music Square East, Nashville, TN on Thursday, June 7, 2018 at 1 PM. Tickets are on sale now and cost $49.99, and include an acoustic performance, meet & greet, photo opp, and exclusive merchandise!